Speaking of simplifying……..I’ve been thinking quite a bit about the direction I want to go with this little blog of mine. 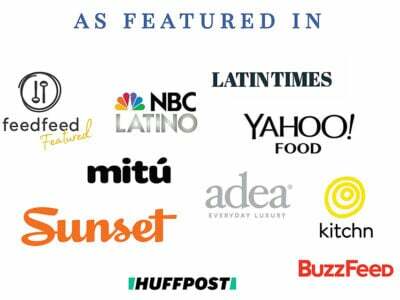 I get a lot of requests from companies to do sponsored blog posts. For those of you that are not familiar with this, a sponsored blog post is where I feature a specific product and I get compensated for that. In other words, an advertisement disguised as a blog post. After much thought and consideration, I decided NOT to do ANY sponsored blog posts for a specific product. The work and effort involved is not worth my time. Luckily I have a pretty awesome job where I get compensated well so I’m not looking to make a living from their sponsorships. I will continue to have the ads on the sidebar (I hope you don’t mind them) since it helps me pay for some of the expenses that it takes to run a blog. Having said that, I will continue to share my passion and reason for my blog: “talk” about foods that inspire me each and every day. These recipes are what we eat at home and what I love sharing with friends and family. Nothing extravagant. Just simple healthy food with the ocasional indulgent meal. Normally carnitas are very fatty and I would not consider them as a healthy dish! That’s due to the type of meat you cook and how much fat you include in it. Using lean pork, in this case tenderloin, will reduce the fat and all you have left is a dish that consists of lean protein. 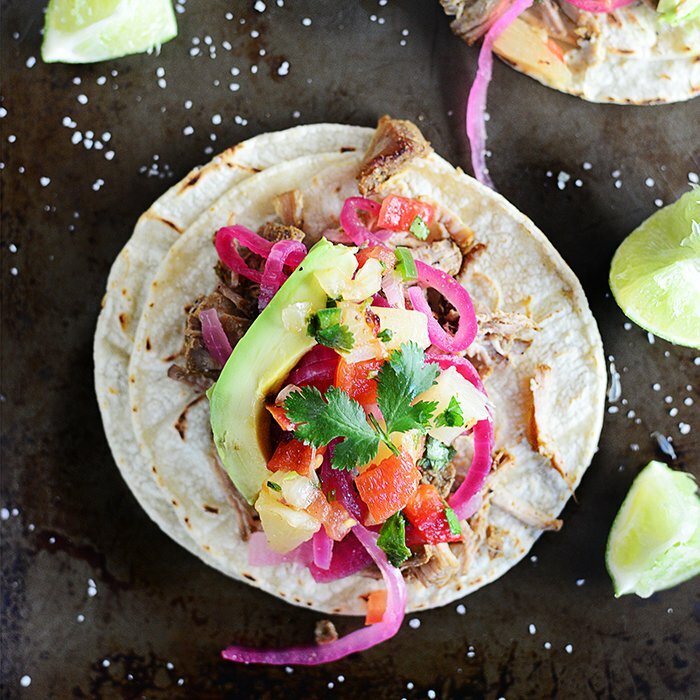 The spiciness of these carnitas comes from the chipotle pepper and the pineapple salsa gives a great blend of spicy and sweet flavor to the tacos. I hope you enjoy it! As far as calories goes for this recipe, it’s hard to set a specific number since what you put in your tacos will vary that number. I usually get tortillas with the lowest amount of calories since I’m a big eater and try to get the most volume for my calories ;). 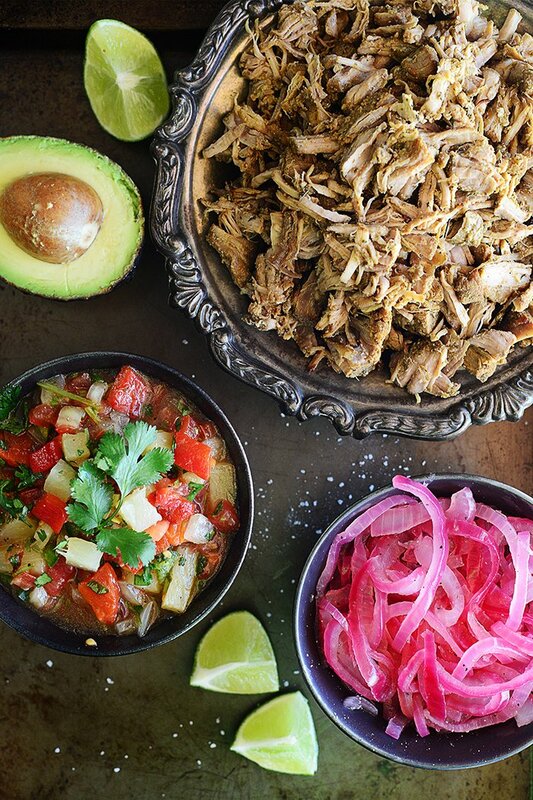 Make these delicious carnitas and serve them as tacos. 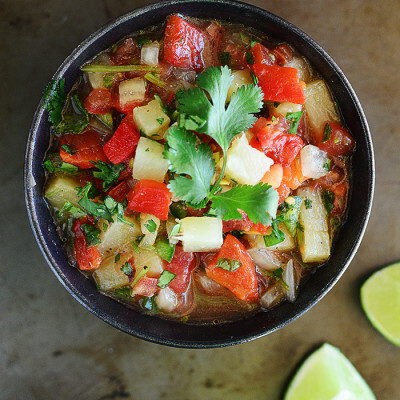 Add this delicious pineapple salsa, avocado, pickled onions and a splash or lime juice and you’re set! Coat the crockpot with cooking spray. Add the pork tenderloin chunks and cover with the spices mixture. Rub the pork with the mixture to make sure the pork is coated well. Cook for 3 to 4 hours on high or 5 to 6 hours on low until the pork is fork tender. Remove the pork from the crockpot and place in a large bowl. Discard all of the juice and mixture from the crockpot. Shred the pork using two forks. Place the shredded pork on a cooking sheet and broil until the meat starts to get a little crispy. Make sure not to burn the pork! 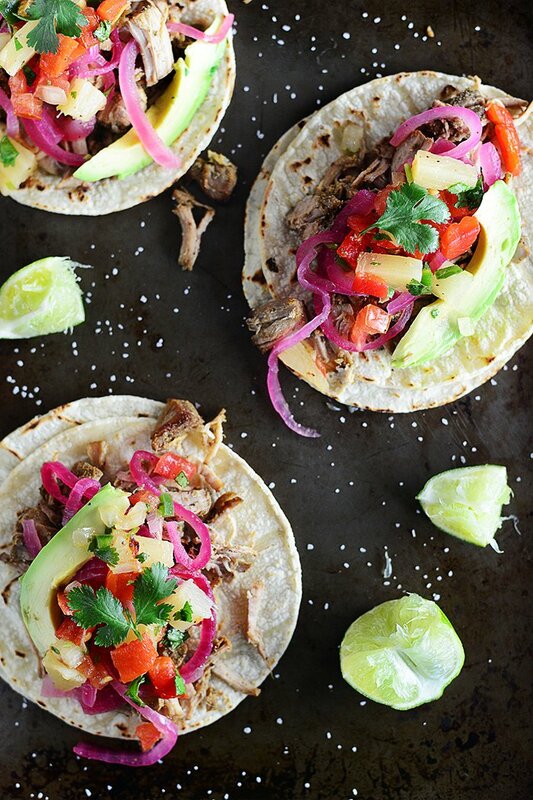 Serve carnitas on corn tortillas, top with avocado, pickled onions & the salsa of your choice. Recommended with the featured pineapple salsa. To roast the red pepper, brush lightly with 1 tablespoon olive oil and place on a heated grill or directly on the gas stove burner. Grill until the skin is completely wrinkled and the peppers are charred, turning them twice during roasting. About 10 minutes total. Remove from grill/stove and immediately cover it tightly with aluminum foil. Set aside for 10 minutes, or until the peppers are cool enough to handle. Remove the peels and seeds. Chop finely. In a large bowl, combine all ingredients and toss to combine. Cover and refrigerate until ready to serve. 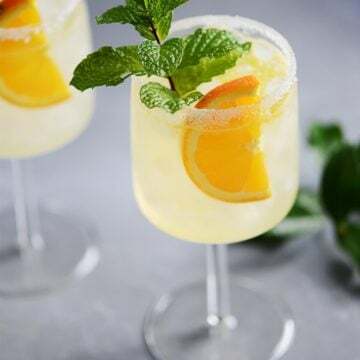 Hi Ana – This recipe looks so great! I write for ParentMap.com and would love to include this idea in a roundup article of Farmer’s Market Recipes. 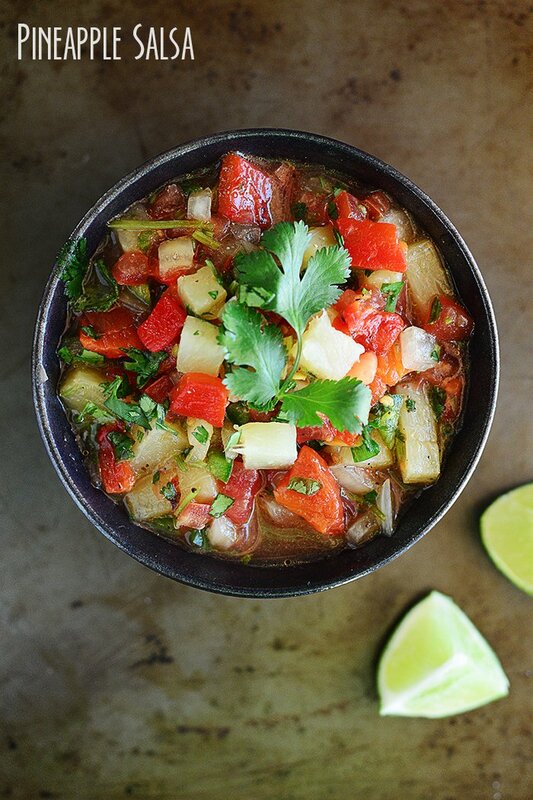 We would describe the recipe in our own words, and link back/credit your site for the recipe and use one image. Would you be OK with this? Hi Sharlyn! Sorry I’m just seeing your comment. Of course you may link to this. I really appreciate your consideration! I’ll check out your website 🙂 Have a great day!